Bad weather is expected in Iceland for the next few days. Storm can be expected to take place. I am not sure on the details. Check Icelandic Met Office weather information for more details. The eruption in Holuhraun has picked up again from a minor slowdown on Saturday. Strong earthquake activity continues in Bárðarbunga volcano. Strongest earthquake on 6-October-2014 was a magnitude 5,1 earthquake. Other earthquakes have been smaller in magnitude. Bad weather is preventing good observation of Bárðarbunga volcano, both in Holuhraun and over Vatnajökull glacier. Visibility can be extremely limited at times. SO2 pollution was detected in Reykjavík during the evening of 6-October-2014. It did go over 700 μg/m³ for a short moment in Reykjavík and nearby area. More pollution from the eruption is expected tomorrow. The lava field in Holuhraun eruption is now larger than 50 square kilometres in size. I don’t have the exact size for today. 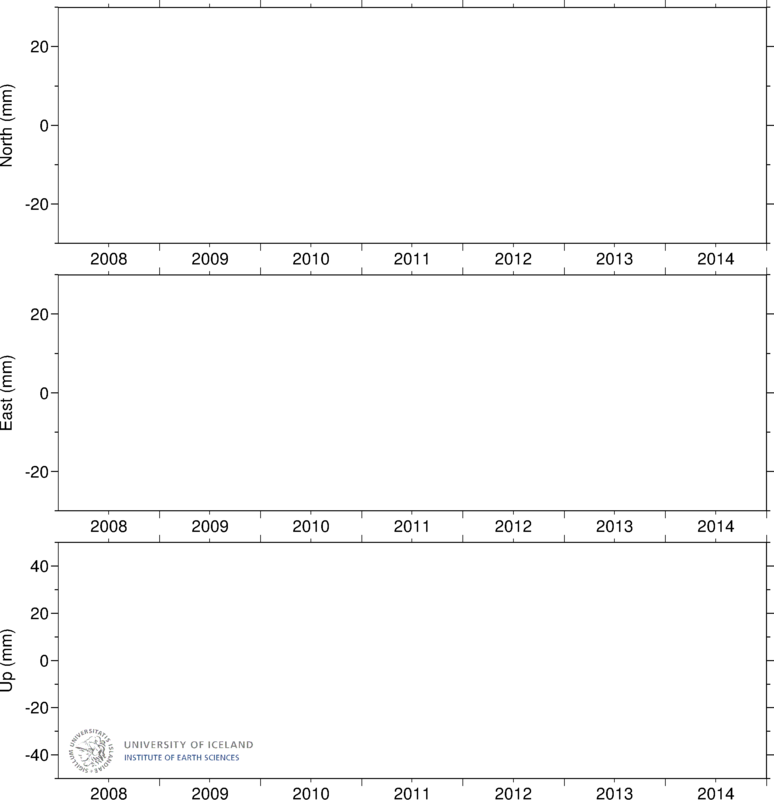 Bárðarbunga volcano caldera continues to drop and has dropped more than 30 meters by now. The activity in Holuhraun appears to be slowly getting smaller with time. This is normal, this also increases the risk of new eruption starting soon. No further information for today that I am aware of at this moment. The earthquake activity in the past 48 hours in Bárðarbunga volcano. Green stars are earthquakes with magnitude above 3,0. Copyright of this image belongs to Icelandic Met Office. Earthquake activity picked up on Saturday compared to Friday and Sunday. Eruption activity did drop in Holuhraun craters on Saturday, it did pick up again on Sunday far as I know. Far as I know there is nothing else to report. It is also worth to mention that only north part of the Bárðarbunga volcano system has shown rifting in only one fault. There are many more in this area that have not yet moved. I expect them to move in next few months to years. Then there is the matter of all the activity that is going to take place in Bárðarbunga volcano south of it. That area has not moved so far, it is going to rift in the same manner as the area in the north of Bárðarbunga volcano. When is impossible to know, but I expect it to happen in next few months to years. This is far from over, in fact, this activity in Bárðarbunga volcano has barely started, even if it has been erupting now for almost one month and a half. There are going to be quiet period with no eruption activity in Bárðarbunga volcano during this process. Those quiet periods are going to be different in length, they are going to happen, it is just a matter of time. That is how rifting works in rifting zones (and rift valley) around the world. Next update is tomorrow if nothing major happens in Bárðarbunga volcano. Article updated at 01:09 UTC on 07-October-2014. This entry was posted in Bárðarbunga, Caldera, Collapse, Dyke intrusions, Earthquakes, Eruptions, Glacier flood, GPS data, GPS Monitoring, Harmonic tremors, Inflation, Lava, Magma, Monitoring, Mountain, Swarm, Tremor plots, Vatnajökull glacier, Volcano, Weather, Wind. Bookmark the permalink. Thanks, Jon for your current update. Glad you are back! I am enjoying this site, and learning lots of information about Iceland and it’s geology. I appreciate the time and energy you are putting into this web site, and I am hoping you had a much deserved restful vacation. Just wanted to add; geologic time moves so slowly that it is hard for us to comprehend all that is going on with the current eruption. We try to figure out what is going on with BB, but the time scale for the events that are unfolding and will unfold in the months/years ahead are very difficult to grasp. Human time and Earth/geologic time just don’t seem to fit together unless we are looking back in time at events that were written in rocks and landforms that are sometimes thousands of years old. I guess that we must be more patient. A voice of reason is back. Thank goodness. Hope you enjoyed your rest. I noticed in the rifting info that you provided that Lake Biakal in Siberia is on one of the rifts. Thank you for providing that! I am trying to piece together years & years of gathered info from here & there. I have been putting a lifetime puzzle in to place & am learning much here from many. With a rifting area at that lake it makes sense to me now why the magnetic north pole has picked up from moving to that lake at 5 miles per year to 40 miles per year now! Thanks for sharing! I also aam getting closer to understanding an ancient fault line running from Maine to Pennsylvania, possibly from the Ottowa-Bonnechere (Grabab/spelling?) rift. Need to figure if they tie together somehow under Bardabunga? Any knowledge appreciated & many thanks in advance! Some trivia: Speak like a Viking! I have fixed that error. If some more spelling errors have made there way into the text. Please let me know so I can fix them. I am no fan of them. Fixed. I am moving languages (Danish and German) around in my head. This means worlds of problems for my spelling in Icelandic and English. I think I put this on the wrong page . . . so I’ll put it here where the current dialogue seems to be . . . Welcome back, Jon. I hope your time away was restorative.
. . . it appears to take a detour . . . a kind of a big bump or carbuncle on its face at Iceland–wherein Iceland seems to bump it quite out of the line it would normally seem to have taken. Is the theory that the hot spot is responsible for that? It seems like I’ve read something along those lines. However, I don’t understand how a hot spot would cause such changes in the normal Mid Atlantic Rift’s dynamics and geography, physics. I don’t know that you have any insights on the above but I’d love to read any you might have. Have it pulled up to watch, now. What would you guess will be the next dramatic thing in the region? A follow-on vid talks about the Hawaiian plume being 1500 km deep. It would appear that the Iceland plume is quite comparable from what I understand and have been reading. I don’t know that Iceland has been instrumented as that study was around Hawaii. Yet there’s been a lot of talk about how the magma is coming up from very deep below Iceland. They must have grounds for saying that. 1500 km sounds plenty deep, to me. Off and on, it has sounded–per the quakes reported–that the ridge off the South (Reykjanes ridge, & the REykjanes peninsula–and the Tjornes fracture zone–MIGHT be signaling some interesting goings on–on both ends of the ‘RIFT BULDGE’ that is below and comprises Iceland. Or am I all wet in what I’m noticing? Da Xin, all of this is a learning curve for everyone. This is an event that no one knows what will happen for sure. Jon writes a very good header to these posts and keeps it up to date. The best thing you can do is watch all the different sources of information and watch events unfold. We are all prone to guessing the outcome, some of us (me included) have a particular scenario in mind. As Jon says though this is an event that could go on for months or years. There is evidence that the current events started in 1996, some say even earlier in the 1970’s. It was Graben. My fault, not Jon’s. Early yet but an apparent acceleration in vertical displacement of 1 meter in just over 4 hours ! Watch this space…. Meanwhile back at the plot ☺ @vat the green tremor is intensifying more than the red. Generally tremor is trending up in th bb area. Is that my imagination, or do the recent quakes seem to be branching out to the north and northeast from the caldera? See http://en.vedur.is/earthquakes-and-volcanism/earthquakes/vatnajokull/ for this. It seems as if they are starting to move again? Not your imagination. It has been noticed elsewhere too. The rate of caldera subsidence has slowed down a bit, maybe just an interlude or maybe emtering a new phase? 1500 km would be what % of the diameter of the earth? Hmmmm At the equator, it is 12,756.32 km. And at the poles . . . 12,715.43 km. Using the 12,715.43 given Iceland is closer to the pole . . . 1500 km would be about 12% of the diameter of the planet. WOW. I expected a much smaller figure. My simple math could be wrong. Not my strength.
. . . which triggers a stray trivia factoid from the depths of my memory . . . supposedly . . . if a billiard ball were as large as the planet–the earth would be smoother than the billiard ball, in comparison. Hard to imagine. Particularly with places like Iceland, Hawaii & the Canary Islands etc. being such high mountains from their baselines. I wonder why such plumes don’t foster lateral routes for magma? Why such a long/high seemingly remarkably straight plume above even the surface of the ocean? Glad you saw it and that it wasn’t as completely confusing as I feared it might be. Setting out to write it I thought it would be simple, but then found myself floundering for words. This magma is hot enough to melt nearby crust. That does take time and this magma is not going to stay long enough in this area to do so (the magma chamber that is now collapsing). Are you saying the bottom of the top magma chamber is collapsing, drawing the top of the magma away from the “cork”? They are not sure if there is an top magma chamber. That is just an idea and it appears to be a weak one. There might be a magma chamber at 3 to 5 km depth and a second one at depth of more then 10 km depth. Exact depth is not known. While nothing is to see on mila’s bardabunga livecams I switched to Jökulsarlon. Weather must be really unpleasant at the moment – the cam is shaking from the wind and I never noticed that few tourists there before. And strange: Almost all icebergs are gone. Sometimes flood comes in/goes out and drives all icebergs in one direction and also the wind does something similar. oh dear, M 6+ !! EMSC say : 5,5 in 15 km deep ! EMSC Change the deep. 2km deep. 5.5, at 7.5 km. deep, south east of BB. It´s in the area where the dyke originally started. If there is no felsic magma in the caldera system,what is causing all the magnitude 5 earthquakes in and around the caldera,would not basalt have already exploited weakness around the caldera and erupted?Surely more highly evolved magma is not unprecedented in Iceland? He mentions rhyolite quite frequently.The easier and more predictable route is to assume a shallow chamber of basalt,but the possibility of rhyolite obviously figures in his thinking. When the collapse that created the caldera in the first place happened, the floor of the caldera is likely broken and jumbled and not one solid “plug” of material. It likely has a series of cracks (looking from above, they might appear as concentric rings of cracks, or might be a “web” like pattern). Many of these have likely been filled by previous subglacial dome building events. Such events can happen rather frequently (in geological timescales) and can go unnoticed on the surface. So we likely have a situation in that caldera “plug” where there are a lot of fractures that new magma can make its way through given enough pressure. The magma at the current fission is mafic and has become more mafic as it has progressed, according to the analysis I saw a few weeks ago. This has led to the notion that the source of the magma of the current eruption is deep (greater than 10km depth) and not from a shallow magma chamber under the main caldera. So this does not appear to be magma being squeezed out from under the caldera but rather new magma that has relatively recently been injected into the system judging from the chemical composition. Looking at events so far, having taken into account the average periods between events, i think we are probably looking at a major event happening (in geological time) of “getting up in the morning and putting the kettle on then waiting 3 year’s for it to boil”. This could be the case! Seems like the whole vedur.is site is down. This has never happened before. Glad someone else is having the same problem. I was about to post an SOS! It´s back up now, we can all relax. What was the approximate drop in centimetres from the 5.5M this morning on the GPS? The 5.5 is not shown on the plot, but there was a drop of 15 to 20 cm at about the right time. Maybe the kettle is boiling now. Site back up. Gps all over the place. Accelerated dropping. The 2 aftershocks have been revised upwards to 4’s… with continued GPS drop off since..something significant has occurred. Shall we stick to talking about Icelandic vocanoes, rather than narcissistic meanderings? If you were referring to me ?It was interesting that Carl at VC talked about a pancake shallow magma chamber containing rhyolite mush. The Grimsvotn eruption that caused a major Jokulhaup in 1996 first started rumblings in 1974, so don’t hold your breath just yet. This saga has a long way to go yet..
Also, n the 1996 eruption it took weeks before there was a visible eruption through the glacier. Throughout that time there was ice melt and glacier collapse in several ‘bowls’. Maybe that’s what the Bardarbunga GPS is showing us. Without a fresh flyover with some pretty sophisticated ice penetrating radar, melting ice is the obvious conclusion as to what we are observing. The subsidence graph stopped updating again. For some weeks now there was at least 4 new confirmed cauldrons on Vatnajökull from this current volcanic event. But yes a fresh fly over when weather and funds allows would confirm of anymore developments with these or any potential new ones. They did fly over the volcano on Saturday, Oct. 4. They say it on the Icelandic webpage of University of Iceland and add that Morten S. Riihus took the pictures on the page (from the same day). I always knew that cold fusion was real! But seriously what “fusion” is he talking about? Shortly after the eruption in Gjálp, some cracks started forming on Sprengisandur. Oh dear – here we go again! Sorry, but I suggest you read a bit of background on eg IMO and IES websites, or even Icelandic newspapers’ English pages before making pronunciations – as opposed to asking questions. Both these points have been extensively covered on them, and also here and on other well-informed blogs quite recently. What I dont like is how much all the plots flatlined since the quake. It is just as if we are entering a new phase where things will start going very quickly. The collapse in the caldera seems to have accelerated since the quake and seems to be going just too smooth IMHO. I would not be surprised if this is just calm before the storm of a series of accelerated events. I have been wondering for a long time what is holding up Bard. Looks like most of the news and speculations are starting to settle in on a very long term process here not an imminent large scale event. Just keep in mind that all of this is, indeed, speculation and the entire system could rip wide open tomorrow or it could simply stop one hour from now. Nobody knows what is actually going on down there or the state of the system in any significant detail. I speculate myself, but I am not too invested in it. The idea of the speculation being to give people the awareness that there are other things going on that could produce the same indications we are seeing and that we don’t know with any certainty what will happen an hour from now. This is one of those things that you simply have to watch and see what happens. Prepare for the worst, hope for the best, and watch. Well, there’s a difference between informed and uniformed speculation, and between informed inference from as much well-founded data as is available and uninformed inference from little, if any, data, isn’t there? Is uninformed speculation any worse than uninformed use of data? Is everyone watching the subsidence graph wondering if the apparently newly steeper slope since 21:00 on the 6th or so and especially since the 5.5 eq is going to pan out, but afraid to say anything, having been proven wrong so many times before? I know I am. Lol I expect it will come up a bit and then continue on down at the same old pace, It is still falling exactly to it’s trend line. Big hiccup on VONC gps recently, settling back now. Maybe it was the Blatant heat of confusion. Looks like the dyke is beeing fed … quakes turning up again there now. If you swivel the 3d graph on http://baering.github.io/ you can see an interesting shape to that swarm of microquakes, too. Upper chamber heating and expanding,lower magma reservoir already hot and gaining more magma.I think falling lid causing quakes is a fairytale,but that is uninformed speculation! I wish there were a GPS over the caldera rim in addition to the caldera center. Would be interesting to compare the two. Yes there should really be an array of gps to get a better picture? Maybe there is they just aren’t sharing it. Did some calculation for those interested. Mila camera 1&2 visible at present for the first time in days. From when we last had a clear view a 2nd vent had opened but it was difficult to judge the distance from main vent. It now appears that the cone has collapsed some and linked the main vent to smaller vent. If I’m seeing this wrongly, then the magma flow has increased substantially as I see it and lava flow has increased from the fissure. Any thoughts? Visibility has gone again just the briefest of windows. Do you have a link to the new article? I can’t seem to find it. At least I can’t find one dated 8 Oct.
Its only for 7-October-2014. Its the first one on this website at the moment. I asked a question earlir, but did not see any answers from anyone or tbouvhts so I researched for a few hours for a few days. So if anyone has the same question anytime: The answer is: Well they all interact with one another & are fairly young, therefore much of what is there can still be fairly hidden, but not otof the possibilities. Names: Moma, Gakkel & Latveh Sea. Are more, but these are pertinent to the the #2 question above. If Bardabunga has a huge erjption & affects rifts &/or plates the 3 names mentioned could show activity, some anamolous. Anyway whatever comes out of this should be highly alkinilitic.